Once I made a New Year’s Resolution not to put pressure on myself by making a New Year’s Resolution…whoops. Hey, how come Tom Hiddleston (Loki) isn’t on here?? Highest = my first-ever offer letter in 2014! Lowest = the 164 rejection letters that came before that! THE EMPEROR’S DAUGHTERS, the 4th book in my Jordinia series (Fantasy), is coming in 2018, along with an e-box set of the entire series. Don’t know about my tooth, but I’d gladly let Sour Patch Kids burn a hole through my tongue. Home office with spa soundtrack…unless my husband and son are home! The romance sub-genres under which I’m published currently include fantasy and historical. I reckon it says I like to escape far beyond the here & now…and I like to take my readers with me! Marion Zimmer Bradley taught me the joy of epic historical fantasy. J.K. Rowling taught me that you’re never too old for adventure. Both lessons translate into my writing of romantic adventures, be they historical or fantasy, every day. Outline, outline, outline! I usually create an outline of at least 25 single-spaced pages, hashing out the plot and all the characters, before writing the first word of the story. Anything indoors – snow gives me the blues! The character of Orion in my YA fantasy romance, SECRETS OF ARTEMIS, is most like my husband – a gentle giant. Reposting “Stranger Things” memes. I seriously need a Chief Hopper intervention! I wouldn’t have had the courage to become a published author if not for Michele DeLuca, NY journalist and author of FOREVER MORE: A LOVE STORY FROM THE EDGE OF ETERNITY. Her constant support, readership, and belief in me has carried me farther than I can express. Thank you endlessly, Michele! And thank YOU, Dana, for this fantastic interview! Wishing you all a vibrant and prosperous 2018! They stopped in front of an unassuming door, and Commander Redding pulled the handle. The first word that came to Em’s mind when she stepped inside was minimal. Not that the room was so small. But it was simple, tidy—virtually empty. A wooden bureau stood to the left, its surface clean but for a dimly-lit oil lamp. And to the right sat a single cot dressed in plain, fading linens. A cabin trunk completed the picture, and that was all. The walls and floor were old and unadorned. Commander Redding closed the door, shutting them in. Although he hadn’t yet granted his permission, Em assumed it safe to speak. “This isn’t a place you occupy regularly, is it?” It was more of an observation than a question. Em nodded. It felt strange that the man who had behaved so familiarly with her just moments ago wasn’t even certain of her name. He opened his mouth, then closed it again. Sighing, he pinched the bridge of his nose. Em was reminded of the way it had tickled when he’d brushed it across hers above deck. She shoved the mortifying recollection aside. “I’m at a loss,” he confessed at last. “You want to know what I’m doing here,” she surmised. “Yes, and why! And how you found me—!” He stopped, taking a breath to collect himself. Although he was understandably flustered, it appeared he was the sort of man who kept his temper in check. Em found she liked that. She pursed her lips, her case made. 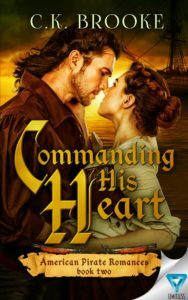 COMMANDING HIS HEART, a September 2017 release from Limitless Publishing and Book 2 in the American Pirate Romances series, may be purchased through these retailers: Amazon and Barnes & Noble. C.K. Brooke is an award-winning author of over a dozen romance and fantasy novels and novellas. Her debut novel, THE DUCHESS QUEST, was selected by Shelf Unbound Magazine as a Top 100 Notable Indie Book of 2015, and her self-published YA novel, SECRETS OF ARTEMIS, received the Indie B.R.A.G. Medallion Award in 2017. 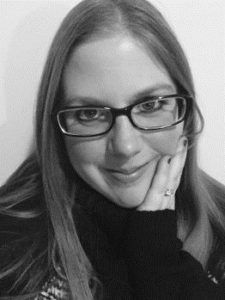 She is also the author of THE WRONG PRINCE (48fourteen, 2016), a Global EBook Award Honorable Mention title, as well as the historical romance, CAPTURING THE CAPTAIN (Limitless, 2016), which was a 2017 RONE Award Nominee and a Finalist in the Mid-Michigan RWA Best Banter Contest. She lives in Washington, Michigan, with her husband and son. Visit her at www.CKBrooke.com and subscribe for a free eBook! Connect with her on Facebook, Twitter and Goodreads.